As the Christmas season approaches, and yet another year comes to an end, it is often a welcome break from the pressures of everyday living … an especially good time to count our blessings ... an appropriate time to say “thank-you” to our many customers and friends. As we pause before we enter a new year, we once again want to tell our valued customers and friends how much we appreciate you. We also want to take this opportunity to advise our customers and suppliers that PATTERSON Industries, commencing in January 2013 will become a Division of ALL-WELD COMPANY LIMITED. 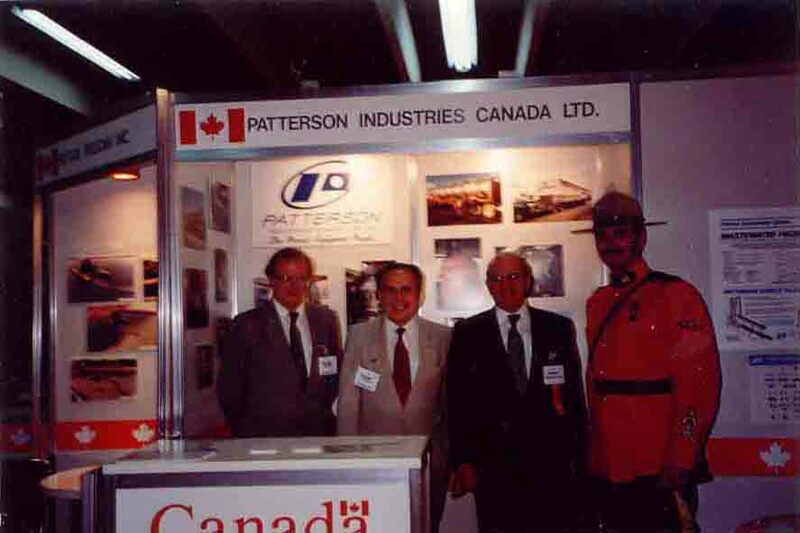 Due to a rezoning to residential of the area of Scarborough that PATTERSON’s plant and offices have been located for over 60 years, PATTERSON INDUSTRIES (CANADA) LIMITED will be closing operations at this location by December 31, 2012. PATTERSON will be moving to a new location operating as a Division of ALL-WELD COMPANY LIMITED with plant and offices on 49 Passmore, Scarborough, ON, M1V 4T1. Our phone and fax numbers as well as our e-mail address and website remain the same. Our website www.pattersonindustries.com with many interactive specification sheets for easy RFQ e-mailing continues to grow. We invite you to visit it to fully inform yourself of our capabilities. 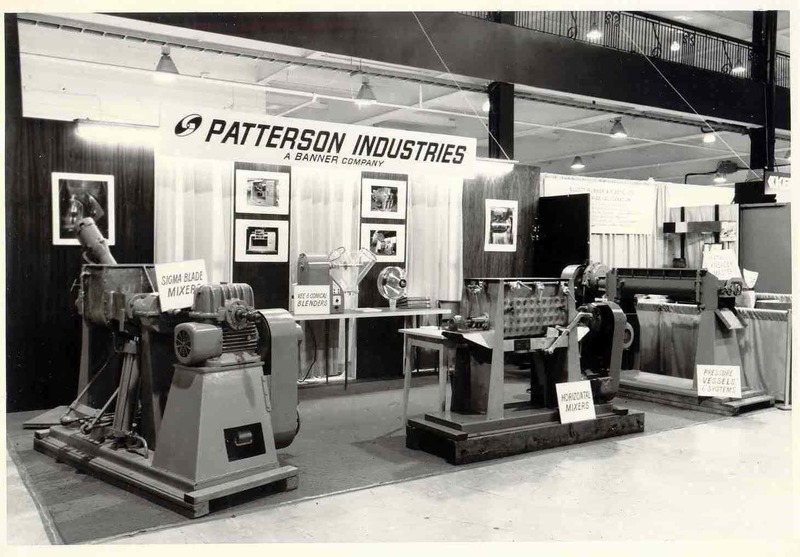 On behalf of all of us at PATTERSON Industries, thank you for the opportunity of serving you in the past. We all wish you a healthy and productive 2013, and hope that PATTERSON equipment will continue to contribute to the success of your company. The PATTERSON family wish you and your family a healthy, prosperous and joyful holiday season. May God's richest blessing be with you in the New Year. 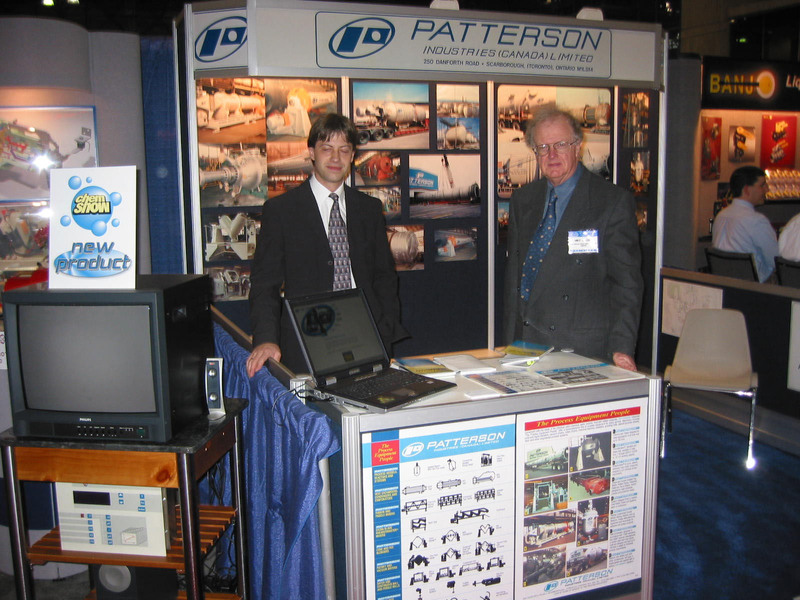 PATTERSON Industries (Canada) Limited, a Process Equipment manufacturer in Canada for over 57 years with a history with the founding parent company going back to 1865 was proud to attend the Chem Show 2003 as an exhibitor. Although the revolution and information technology driven by the internet is making trade exhibitions in general increasingly less important, we are happy to greet many old friends and customers at the show. We thought it important to recall the successes and services outlined in the article on the history of the Chem Show. Europe was at war in 1915, and American imports of dyestuffs, aspirin and other chemical products were cut off. There was skepticism that the American chemical industry was sophisticated enough to take up the slack, but it chose to rise to the occasion. The resulting need to bring equipment manufacturers and chemical producers together led to the “First National Exposition of the Chemical Industries” in New York the autumn of that year. That 83-exhibitor event was the first edition of what was later to become known as the Chem Show. During its infancy, the Chem Show’s fantastic growth paralleled that of the early process industries; by 1917, for instance, the number of exhibitors at the Exposition had already grown to 288. The theme of the 1943 Exposition was dominated by World War II. Next came the postwar boom years, followed by a brief but dramatic consolidation during the petroleum crisis of the early 1970s. The industry recovered but had to face increasing environmental regulation and the recession of the early 1980s. Reflecting that movement, the Chem Show saw significant increases in the number of displayed products designed to reduce air and water pollution. The 1980s brought downsizing, consolidation and efforts to increase quality control and efficiency, trends which continued into the 1990s. Meanwhile, the 1995 Chem Show, also called the 46th CPI Exposition, set new records, with 869 exhibiting companies using more than 173,000 net sq. ft. of display space, and more than 17,600 registered visitors (not including 9,257 exhibitor personnel) giving that event its highest attendance in 14 years. The geographic breakdown of the exhibitors reflected the growing globalization of the chemical process industries. 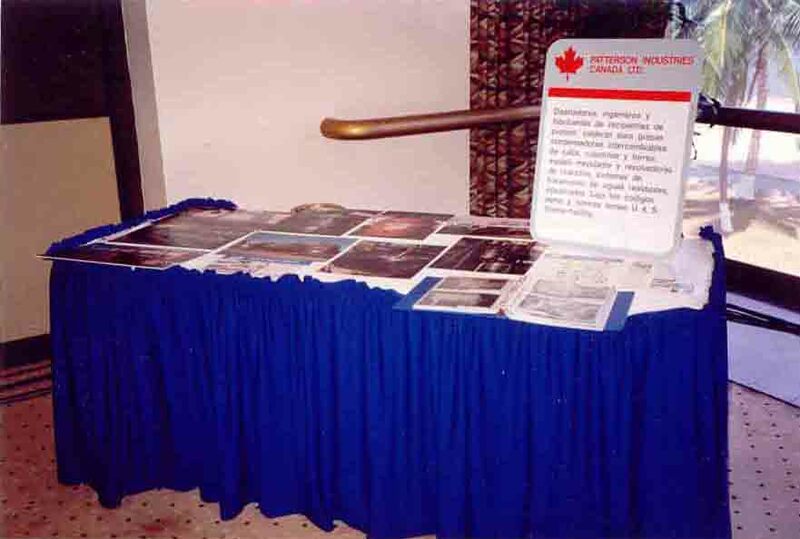 Although attendance dropped off slightly for the 1997 and 1999 Chem Shows, the number of exhibitors and the amount of display space both continued to rise. The 2001 Show faced a new challenge — weathering the 9/11 terrorist attacks that had occurred only a few weeks before the Exposition was due to open. Some companies chose not to follow through with their plans to exhibit and attendance was down. But the thousands of CPI professionals who did attend represented a shining endorsement of just how valuable the Chem Show really continues to be for the chemical process industries. Excerpted from “The Chem Show: 80 Years of Success Serving the Chemical Process Industries,” by Clay Stevens, President, International Exposition Co.
2003 has been a milestone year in several ways. The Chem Show marks the event’s 50th year and 88th year in business. 2003 also marks Dow Corning’s 60th year in business. For myself, after joining Dow Corning in 1967, the first event I attended was the Chem Show in that year. It is remarkable to consider how far the industry has come since then. At that Chem Show, the attendees eagerly gathered up product information, brochures and other literature at information booths to lug home. Information was power. Back then, value was based on what was taken from books, technical seminars and trade shows and events like the Chem Show. With a few clicks on the World Wide Web today, everyone in the world has access to much of the same information. 1967 was a time before globalization, when US companies were lords of their domain. American technology far surpassed overseas alternatives. Major U.S. companies had few worries about foreign competition, and trade barriers protected domestic markets. Looking back at the chemical industry in the 1960s and 1970s, those decades may have lacked information technology, but they were the heyday for the industry. Demand was strong for our products. The world was hungry for innovative applications, new product features and new ideas. Demand out-stripped supply. Prices climbed, profitability grew, and there was plenty of innovation to spread around. Chemical companies faced little competition on a global basis, and most organizations were known for their own areas of innovation or specialization. Profitability came easier three decades ago when energy was inexpensive. Public trust in the industry was high in those years. Chemical companies were regularly praised for their many contributions to peoples’ lives and society. Communities around our plants were supportive and recognized the employment and financial benefits they provided. Before the 1970s, there were few special interest groups. It was public opposition to the Vietnam conflict that was later adapted for other causes such as environmental protection, animal rights and pressure groups. Public perceptions today are more critical, more skeptical. Today’s challenges are significantly more complex. This is a particularly difficult business environment for the industry. We are facing a wide range of complex issues and mandates that are changing the way employees work and our businesses operate. The staggering advances in information technology have changed the industry. IT advances have launched a business revolution unlike any since the dawn of the industrial revolution. While IT advancements provide clear advantages – such as speeding commercialization and boosting productivity -- information technology has unleashed competition on a global scale. It has made it considerably more difficult to protect intellectual property and maintain a competitive edge. Pricing pressures have ensued, as IT makes the global marketplace transparent, allowing customers to easily compare prices on a worldwide basis. IT has virtually collapsed time and distance. This is coming at a time when companies are consolidating the number of suppliers they buy from. And, the pace of change will quicken -- as information technology advances at a rate that doubles every 7 years. The rising cost of energy--natural gas in particular--is dramatically increasing the cost of operations and squeezing profit margins. Over-building has created global over-capacity, which continues to drive prices down and further erodes profit margins. Complicating these issues is the fact that many parts of the chemical business are maturing. Differentiation has become increasingly more difficult, and a high percentage of all chemical products are now considered to be commodities. These burgeoning pressures have led to weak performance and lower valuations for chemical companies. Specialty chemical companies, once highly valued, now are struggling and are being forced to change or to merge. · Work to better understand the needs of customers. · Seek additional ways your company can help customers with their problems and to seize new opportunities. · Anticipate where the market is going, and proactively develop products and services for the future. · Get out in front of emerging issues. Consider how they can be addressed before new regulations devastate portions of your business. · And, last, involve and empower your employees in these efforts. Give them the training and resources they need to help customers succeed. Perhaps it would be helpful if I share what has happened at my own organization and the lessons we’ve learned. I’m sure your company has its own strategies. Like all chemical companies, Dow Corning has been rocked by global economic forces and competitive pressures. We quickly realized we needed to look at our business in a different way and to make some significant changes if we wanted to maintain our position and grow in the future. Customer research revealed an interesting opportunity. We discovered that our customers need support in non-traditional areas where my company has expertise. Some of these areas include solutions: to improve companies productivity through engineering design, processing and troubleshooting; to train their staffs in chemicals handling and storage; to help companies understand and comply with new regulations; to help companies expand into new geographies or markets; and to optimize their supply chains. We considered what we do everyday as a global business that we could offer to do for customers. The result is we have transformed Dow Corning from a product-only supplier into a solutions company that helps other companies achieve their business goals. By supporting customers in broader ways, many of which don’t even involve products, we are building closer ties to customers. This new way of doing business has ignited an entrepreneurial spirit among our employees. Customers now turn to them not only to purchase raw materials but also for help solving problems and pursuing business opportunities. You can imagine how employees love their new roles. It has made them feel appreciated -- they are valued for their expertise. In fact, we’re now selling their brainpower, in addition to products. We offer their knowledge – our company’s “brain trust” – you could say. The most important thing we’re doing to achieve this is listening – listening to identify where their needs and our expertise lines converge. To facilitate these changes, we enlisted the support of all employees. Not just those who work directly with customers. Everyone in the company is involved –technical service staff, chemical and mechanical engineers, scientists, IT people and our plant operations teams. No longer are customer-facing staff the only ones who have responsibility for addressing customer needs. It’s people like everyone in this room who are called upon to deliver what the company has promised to customers. One worrying trend that industry leadership has noticed relates to deteriorating public opinions about the industry. Media reports, government hearings, consumer letters, and community meetings reflect a high level of fear and distrust about chemicals and the industry. The public has lost sight of the industry’s many contributions and how chemicals make a difference in our lives. So how can we resolve these issues and restore a positive image for the chemical industry? I believe that the industry has a role in this, but each and every one of us also has a role to play. The American Chemistry Council is working to develop a national campaign to improve the reputation of the industry. If approved by the members, the campaign calls for creating a dialog and communicating interactively with a variety of audiences. It’s all about engaging external groups and educating them about the benefits the industry. The ACC board is working with European chemical associations to temper the REACH program and to ensure its regulations are both realistic and practical. Responsible Care practices and public reporting are making a difference, and moving us in the right direction. A demonstrated commitment to sustainability in our operations will accelerate this progress. However, promoting its benefits will do no good if accidents and incidents make the national news. So how can individual engineers, chemists, IT staff, and plant managers make a difference? I have a personal challenge for everyone in this room. We ALL need to get involved in the process to restore public trust and confidence in the industry. And we need to do this both on and off the job. One of the ways out of this dilemma is for us to share the many ways the chemical industry is improving the quality of peoples’ lives, our health, and our world. We all need to start talking – telling our friends, neighbors and communities about value of the industry. We all know about the many safety features in our plants, but the public does not. Let’s talk about what we are doing to protect our employees and the communities around us. Let’s foster openness. Invite the public into our plants to see it for themselves. Look for opportunities to participate in community advisory groups as part of the Responsible Care program. Talk about our progress and our successes. You can start by identifying products your company makes that improve the quality of life. Here are some of the examples we promote at my company: Exciting new products based on nanotechnology and photonics, Small PDA devices in which all our medical information can be kept in one pocket; Chemical industry contributions that protect electronics in cars from heat and wear that help them operate reliably for more than 100,000 miles. We talk about innovations in computer chips that allow electronic devices to be smaller, lighter and to work faster, deodorants that go on dry, shampoos that make our hair shiny, and computers integrated with advanced materials in robots that walk on the moon or assemble electronics and automobiles. The blending of biotechnology and silicon science, a field that my own company is creating with our partner Genencor. We are working together to create biologically mediated silicon-based products for the life sciences, personal care, and fabric care markets. In addition, biotechnology and innovation catalysts technologies can reduce waste. We can talk in terms of the benefits our companies offer, including such things as: protecting the environment through advancements like solar power and “green tires,” which improve gas mileage and resist road resistance; and connecting people to each other and the world through telecommunications and computer equipment. For the engineers in this room, let’s find new ways to reduce energy costs and to become more energy efficient -- chemical process manufacturing have traditionally been energy ‘hogs’. We need to continue to strengthen security and ensure even safer operation of our plants. And let’s develop processes and systems to improve the quality of everything we produce. This is essential to our long-term success. I would like to end as I began, marveling at the remarkable progress the industry has made, despite a challenging business environment. I want to reinforce the importance of each and every one of us considering how our roles – however diverse – can contribute to our companies’ and our industry’s growth and future. And lastly, be a chemistry spokesperson at home and in your community. The good news is that we have a lot to talk about. I’d be happy to take your questions and to hear how your own organizations are meeting the challenges we face today. How does all of this affect designers and manufacturers of process equipment to the Chemical process industries? In their efforts to stay competitive, the large Chemical Companies have shopped the market aggressively for the latest equipment at the lowest prices. As a result, many equipment manufacturers with Engineering staff who possessed "process knowledge and know-how" found themselves uncompetitive. Smaller companies with "a machine shop mentality", who were just building machinery to supplier drawings beat their prices due to lower staff costs but little or no process know-how or engineering capabilities. The end users were now forced to look to their own engineering departments for process and equipment knowledge and know-how. Next they attempted to outsource engineering and procurement to engineering consulting companies in order to "save costs". Since most engineering consulting firms hire many of their engineering personnel only on a project by project basis, it is difficult for them to develop specific process know-how. Lacking the required expertise they then attempt to acquire it as part of the tendering/procurement process. Furthermore, they produce mountains of documentation since they charge on an hourly basis. In the end this process adds 20% to 40% to the cost of projects with dubious benefits. It took some time for the end users to realize that outsourcing of procurement and engineering to large consulting firms was not efficient and added time and costs. As a result the pendulum swung back to do more in-house engineering and a more close relationship with manufacturers that can offer expertise and engineering. A relationship of trust between end users of process equipment and manufacturers with a reputation in the industry for well designed quality equipment in the long run is efficient and benefits not only producers of chemicals and equipment manufacturers but also the industry as a whole and consumers. compact dimensions of 6.4 metres long, 0.9 metres wide and 1.8 metres high. Each contains 1.5 tonnes of S31000, containing 20.5% nickel. an operating pressure of 10.3 bars. ones and friends in the terrible tragedy of September 11, 2001.
next to those of our brethren in arms. for which America and the free world stand for. of our quality of life. brave people of New York to support re-building their economy and their lives. raw materials like drugs, dyes and organic chemicals. and the International Exposition Company is still going strong over 80 years later. the general public and inviting only industry professionals who registered. possible, a vital engine in the development of the huge North American consumer market. increasing environmental regulations and the economic recession of the early 1980’s. for the cheapest equipment from small companies with little or no engineering overhead. the chemical manufacturers continue to foster growth and success into the 21st century. overcome the present sluggishness in the North American as well as world economies. precision machined girth gear and also heavy precision machined forged tires. The following is a reprint from a newsletter issued by the Economic Development Division of the City of Toronto. 50 Tonne PATTERSON Rotary Dryer Exported to U.S.A.
PATTERSON INDUSTRIES (CANADA) LIMITED, which exports equipment worldwide, recently shipped a 50 tonne Rotary Dryer manufactured at its Scarborough location, to the U.S.A. The 75'0" (22.86 m) long dryer is similar to units manufactured earlier for Canadian and Korean clients. Due to size limitations for ocean shipments, the dryers exported to Korea were shipped in two pieces and welded on site. By contrast, the 10'0" (3.04 m) diameter dryer shipped to U.S.A. was transported in one piece. Two cranes were required to move the dryer from the plant to the delivery truck. "IMAGE is you in the public eye, a mental representation of you, or your corporation, a vivid, graphic, instantaneous picture of you in the public mind. It is the impression you make on your fellow man. Whether your image is favorable or unfavorable is up to you. No amount of pleading, publicity or boastful advertising can create a favorable image, - it must be earned. The bases on which it is built are integrity, quality and character. Image based on false foundations is transparent and eventually unfavorable. A good image is beyond price. It is born of the deep and abiding determination to accept and create nothing but the best." The Year – 2001 – is the 56th annual milepost in the progress of our Company here in Canada. 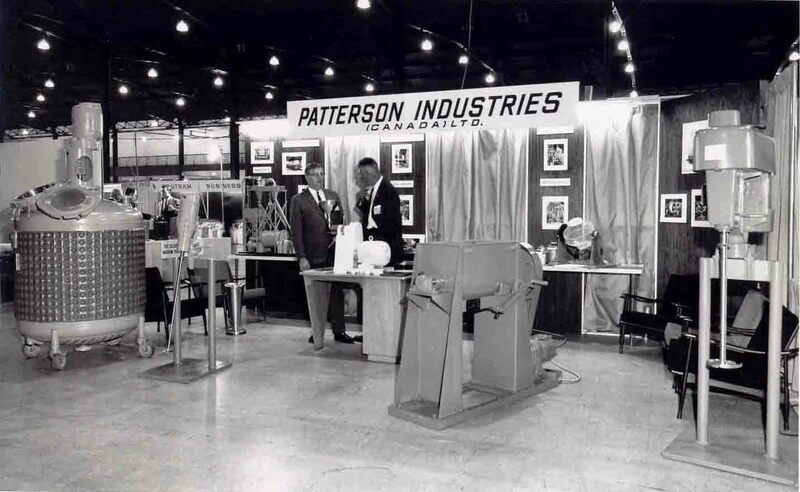 PATTERSON INDUSTRIES (CANADA) LIMITED was founded in 1945, our then parent company was founded in 1865 as PATTERSON Foundry and Machine Company. 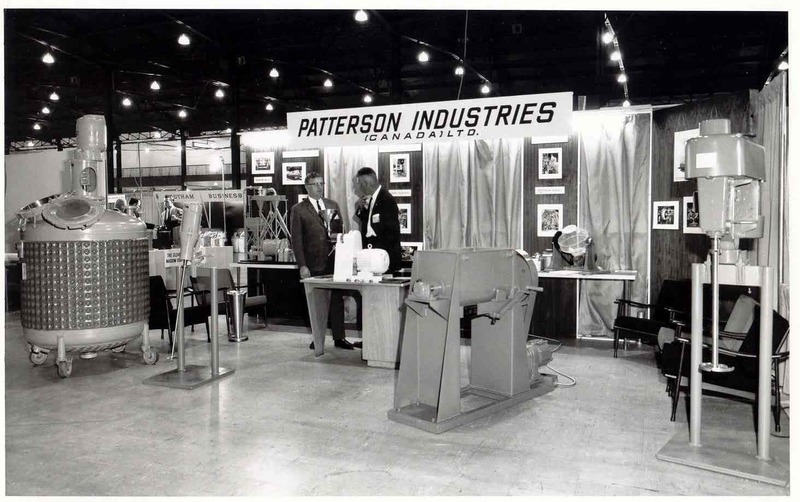 In an America just awakening to the potential of the forthcoming industrial age, PATTERSON originally (and up to 1915) specialized in equipment for ceramics manufacture – until today, through continuous progress, it has become a leading designer and manufacturer of process equipment and systems for the chemical and process industries. The Company’s present activities bear the fruits and benefits of a continued program of research and development. After its incorporation, the Company began expanding its products to meet the needs of the chemical and organic synthesis plants which were just being established throughout North America. This development naturally lead the company to undertake to contract for entire plants and manufacturing facilities. 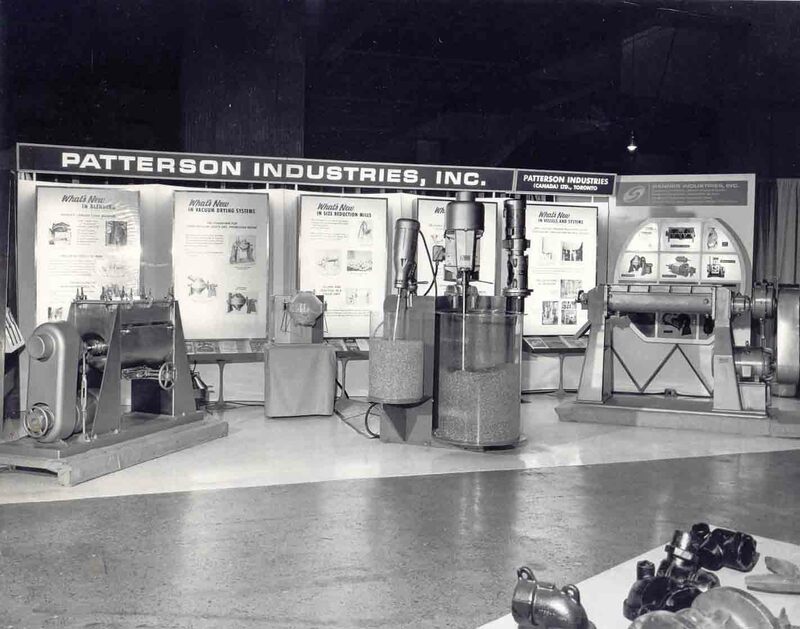 PATTERSON has to its credit an impressive number of patents and achievements in the field of materials processing, including grinding, washing, drying, heating cooling and dissolving. It is interesting to note that in Donald Q. Kern’s book titled “Process Heat Transfer” published in 1950 by the McGraw-Hill Book Company on Page 478, we find under Fig. 15.13 an illustration of a Horizontal thermosyphon reboiler and on Page 481 under Fig. 15.14 an illustration of a Horizontal thermosyphon with double nozzles both with acknowledged references to the PATTERSON Foundry and Machine Company. This hand book is to the present day used by design engineers and contains a wealth of knowledge on process heat transfer design. Active research continued to add new products and the scope of the company’s business was further extended to include complete plant facilities for solvent manufacture such as alcohols, esters and ketones and their nitrated, sulfonated and aminated derivatives. Processes were offered for resin manufacture, soaps, greases, paper and pharmaceuticals, as well as the refining of animal and vegetable fats and oils. Industrial plants all over the world (62 foreign countries) utilize the well known machines made by PATTERSON such as ball, pebble and tube mills, sifters and screens, dryers, blenders, mixers, gas absorbers, autoclaves, digesters and sulfonators - process equipment used in the manufacture of chemicals, paper, rubber, paints and varnishes, porcelain enamel, textiles, and in petroleum refining and innumerable other processes. It is our extensive database of equipment for numerous applications that allows us to draw on our past experience and expertise. 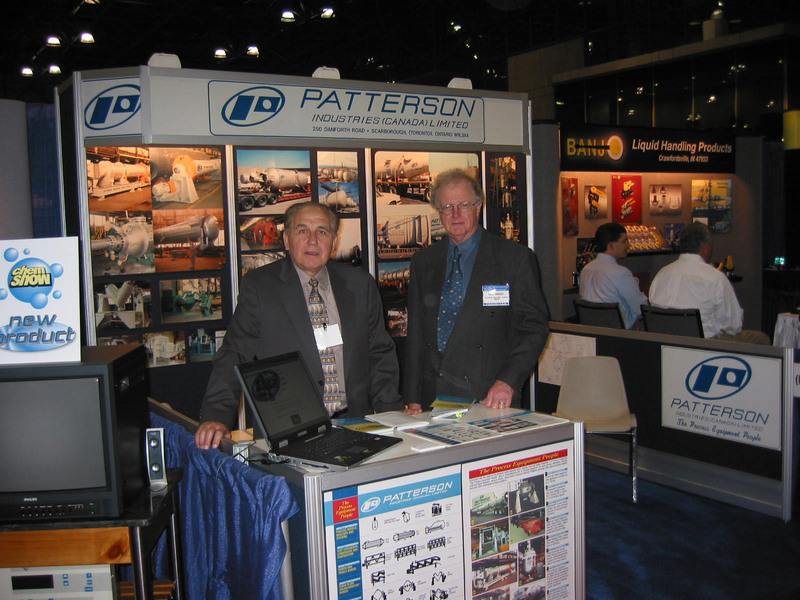 PATTERSON has kept in step and often gets involved with our customer’s individual processes and does analytical work in all processing operations in order to design equipment that meets their needs. 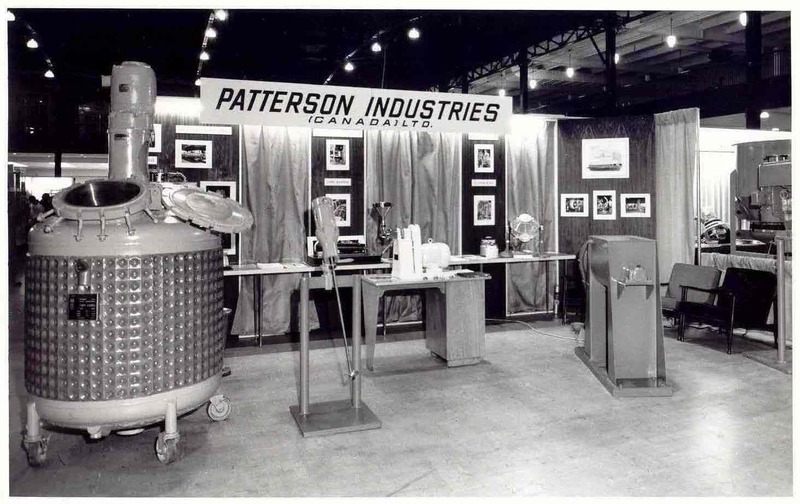 This service, combined with PATTERSON’s experienced engineering staff, accounts for the widely known PATTERSON tradition of creative originality in the design of equipment and systems for the process industries. Unfortunately many good design companies with experienced engineering staff, due to the competitive market over the last 40 years, are no longer in business. We are grateful to our many U.S.A. and Canadian customers who continue to put their trust into the PATTERSON name and trusted log. They are the reason for our continued success. This year - 2001 – is a year of challenges and of opportunities – a year for decisions to point the way and set the pace for tomorrow’s equipment for the process industries. We will do our utmost for PATTERSON’s growth to continue and we are all looking forward to further expansion in the next decade, with the program already under way. 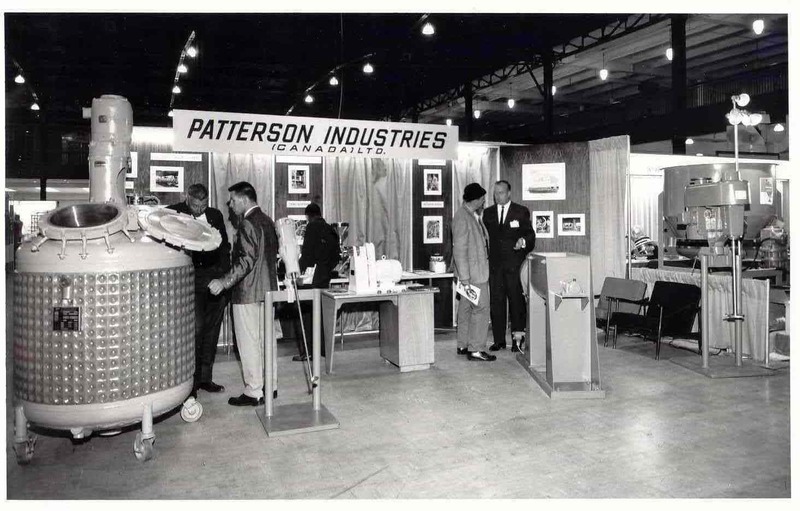 At the beginning of the year 2013, PATTERSON was entering a new chapter in its long history of designing and manufacturing quality equipment for the process industries. Due to the rezoning of the land surrounding the plant, it became imperative to move to a new location. Also the majority shareholder, President & General Manager, Heinz W. Haischt has reached retirement age. 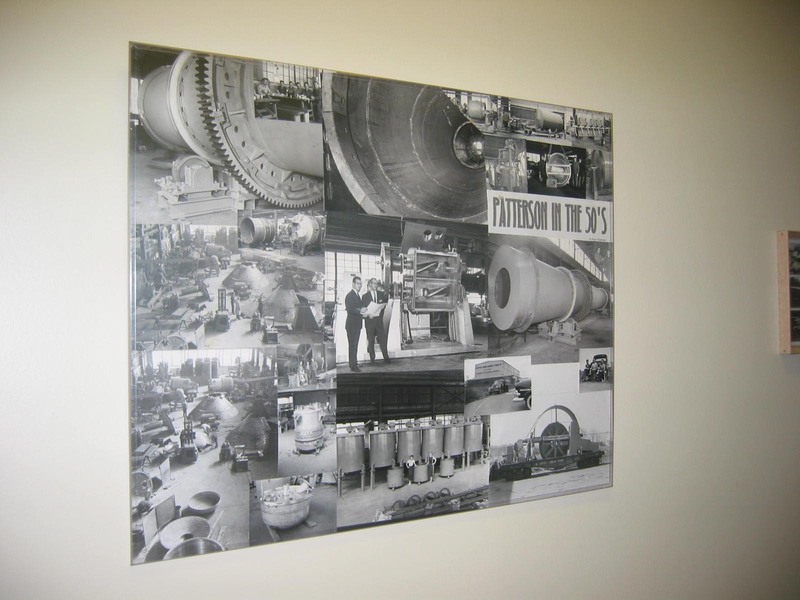 As a result, Heinz W. Haischt, Mike Lindsey and other key personnel will continue to be involved with PATTERSON Canada, Division of ALL-WELD Company Limited to ensure a smooth and seamless transition and to assist in the continuation of manufacturing quality process equipment to PATTERSON'S high standards of quality and reliability. The trademarks, manufacturing rights and design drawings were transferred to ALL-WELD Company Limited, 49 Passmore Avenue, Scarborough, (Toronto) Ontario, M1V 4T1, CANADA.